A journey began in 1979, and still continues today. The GNN Finland association is a result of Arto and Orvokki Sädeaho’s ministry, and, above all, it was established through the miraculous guidance of our Lord Jesus. The GNN association, and all of what GNN represents and what it has become today, is because of the greatness of the Lord that we serve. On August 19th, 1979, Arto decided to dedicate the rest of his life to Jesus. This was followed with a increasing desire and a strong calling to commit his life to missionary work. Arto made the decision to leave his successful career as an entrepreneur. In the beginning of 1985, Arto began focusing on full-time church ministry and missions. 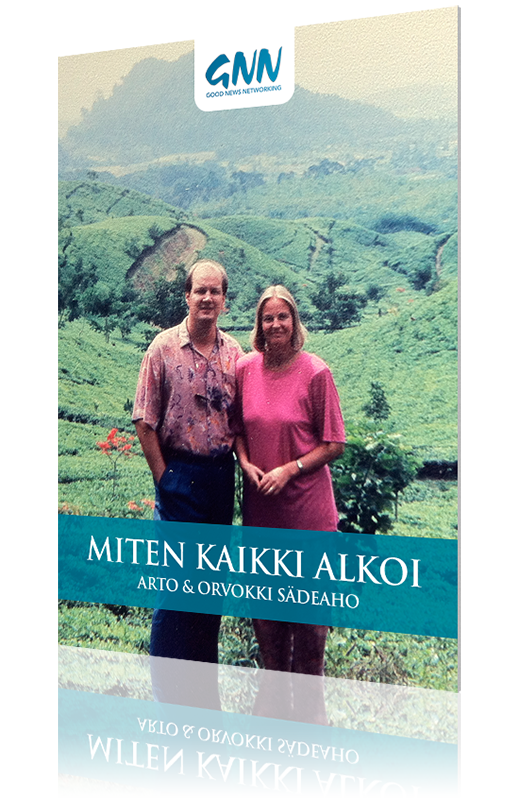 God had already spoken to Arto’s wife, Orvokki, about her calling into ministry a couple of years earlier. These decisions brought Arto and Orvokki to the furthest and most remote villages within the jungles of Indonesia. They also challenged congregations in large cities for the next seven years. During these years they also built up close connections with national church leaders. Later on these connections opened the doors to organize and hold missions seminars During recent years God has extended Arto and Orvokki’s calling into other parts of the world. With the same God-given strength and courage that brought Arto and Orvokki to the mission fields, they were able to start new initiatives, mostly without a financial budget to work with. In the Autumn of 2004, Orvokki became ill with an aggressive form of cancer. God miraculously healed her the following spring and her recovery strengthened Arto and Orvokki’s vision to reach the unreached people. The driving force to Arto and Orvokki has been that God always keeps His promises. Nothing is impossible for Him! The Sädeaho’s have lived to see so many miracles come to pass that they hope their story will be an encouragement to all who are searching for their calling within God’s kingdom.